Medina, a native of Pico Rivera, Calif., is one of two Aggies to start in all 50 games this season and enters the WAC Tournament ranked seventh in the nation in walks with 45 and sixth in walks per game. He also ranked No. 30 nationally in on-base percentage (.471) and finished the WAC regular season ranked No. 1in walks, walks per game and on-base percentage. Medina is No. 5 in runs scored with 23. 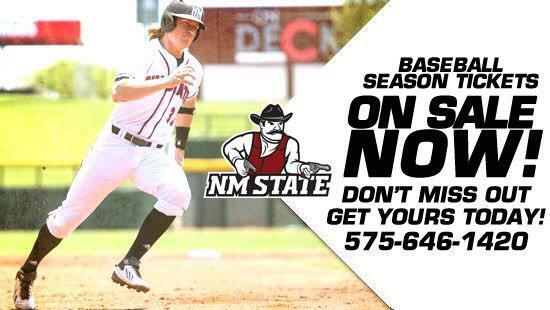 Koerper, who is a native of Las Cruces, N.M., hit .320 on the year and hit .297 in league play. He finished WAC play with 21 RBI, six doubles, one triple and a home run. He had a big game against Bakersfield on May 11 going 6-of-7 with a career-high seven RBI while using a wood bat. He has used a wood bat in the last five games and has gone .526 at the plate going 10-for-19 with four doubles, a home run and eight RBI. Paulson, who transitioned from playing in the infield last season to the outfield this season, is the other Aggie to play in all 50 games this year. He heads into the league tournament with a team-high 59 hits and has a team-best .324 batting average. His batting average rises to .351 in WAC play as he went 34-of-97 at the dish against league opponents with five doubles, a triple, a home run and 22 RBI. Medina, Koerper, Paulson and the rest of the Aggies head into the 2014 WAC Tournament as the No. 6 seed facing No. 3 seed Utah Valley at 8 p.m. (MT), Wednesday, May 21 at Cubs Park in Mesa, Ariz. Radio coverage is scheduled in Las Cruces on KGRT AM 570 with Jeff Matthews giving the play-by-play action.